Comet C/1975 V1 (West) was discovered by Richard M. West of the European Southern Observatory on August 10, 1975. It was discovered photographically rather than visually. By the time it reached perihelion on February 05, 1976 it had reached a dazzling -3 in brightness. At this stage the comet could be observed and studied in broad daylight! The comet is thought to have a near parabolic orbit so it wont be returning anytime soon. 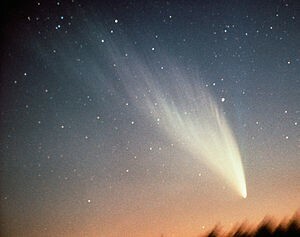 Despite the comet’s exceptional brightness and fantastic tail, media coverage was somewhat diminished. This is thought to be down to a previous comet back in 1973 namely Comet Kohoutek that had been hyped up as a potential ‘great comet’ only to disappoint all with a quite subdued display. Since then, scientists didn’t want to yet again raise expectations only to end up with another ‘damp squid’. On 7th March, reports began to come in of a splitting of the nucleus. By the 18th March, a further two fragments were confirmed making a total of four fragments. The comet’s perihelion passage distance was 0.19 AU which brought the comet too close to the sun given its composition and size resulting in the break up.